We have just a few, but they are extra special good ones. ​Look below and click here to apply for any one of us. 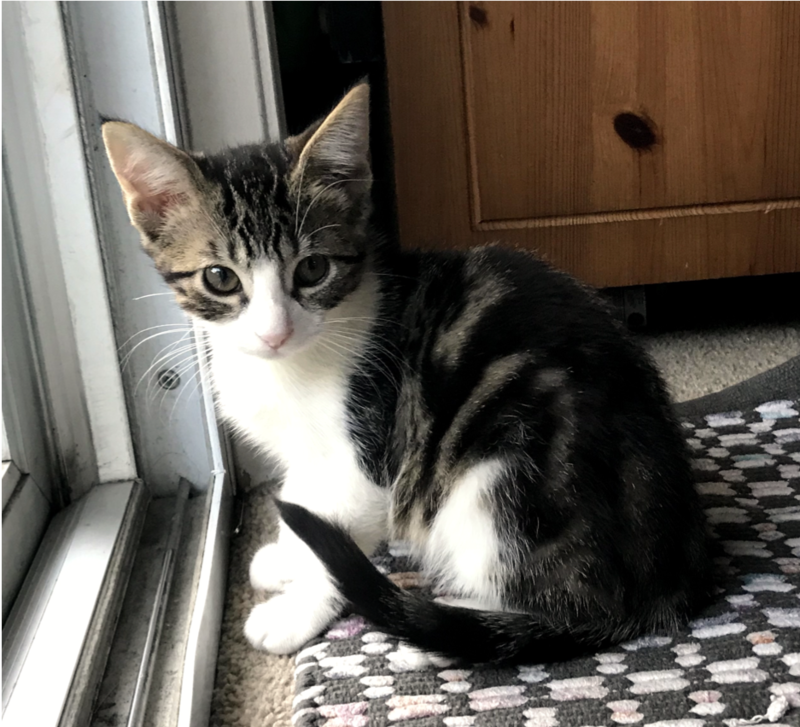 Necco came to us last year as a tiny 4 week old kitten. He is exceptionally friendly and confident, yet he is good with each new roommate. He loves to play and loves to sleep - the perfect balance. 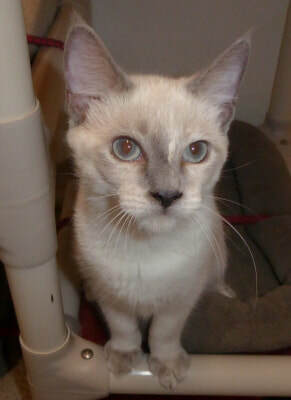 Plus, his favorite thing is to greet each visitor with a hefty purr and snuggle. Sometimes the demand for rescue is huge. 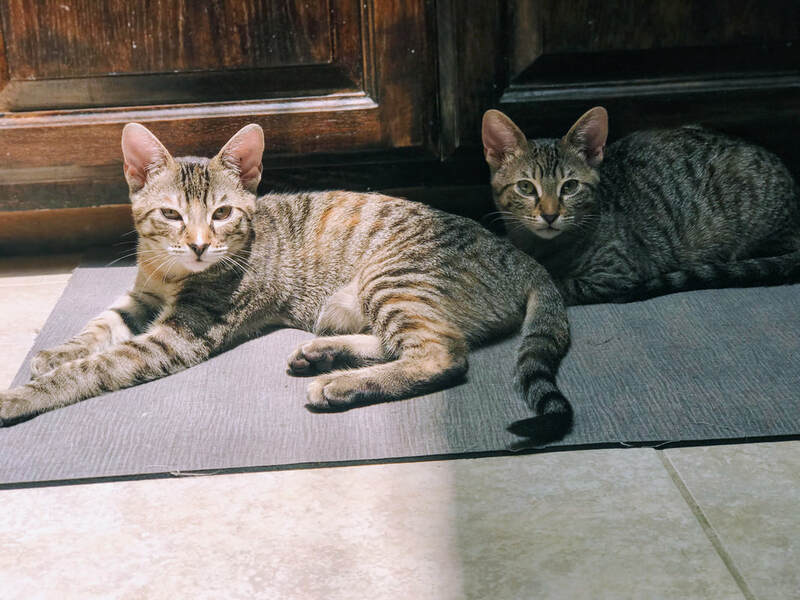 This family almost didn't get rescued because everyone was full and these kittens were sick. A wonderful nurse stepped up to foster them and brought them through. While they will always have watery eyes and noses from time to time, they don't realize it and live life to the fullest. This is Chip and Belle. They've lived with cats, dogs and kids and lots of company so they're ready for anything. 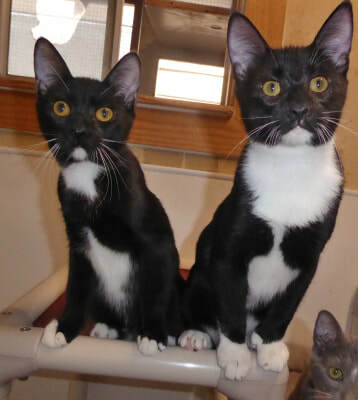 They love to play and are sweetly affectionate. This litter came from a clean up at a feral cat site next to a home with a caring rescuer. Mama was brought in before she delivered her kittens so these babies have never known the drama of living in the bushes or under cars. We took over when they were 5 weeks old and it was so easy for us. They were friendly and healthy. 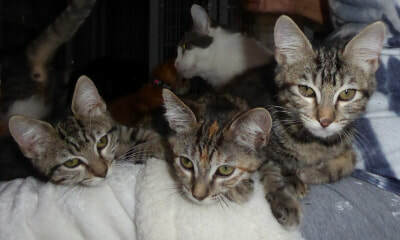 All are now exceptionally affectionate, confident, happy and healthy kittens. Here they are - ready for the rest of their lives! Here we are with some of our friends - All girls except Gregury. This litter came from a clean up at a feral cat site. Mama and her kittens were rescued. What started out as a pick up of two kittens, magically turned into six kittens as they paraded out of the crate where they had been living. C'est la vie!! 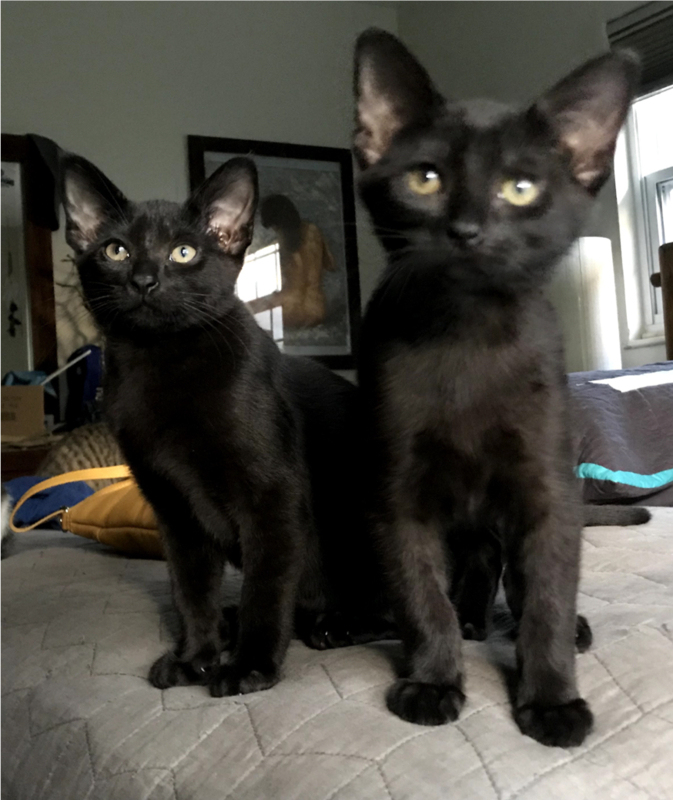 We took them all and they flourished into affectionate playful kittens who enjoy living with people, dogs, kids and cats. Yummy and Katie came from a young community kitty named Myrtle. They started out in the bushes in various backyards. Myrtle would move the kittens from yard to yard, so all the neighbors watched out for them and finally called us in to rescue them. 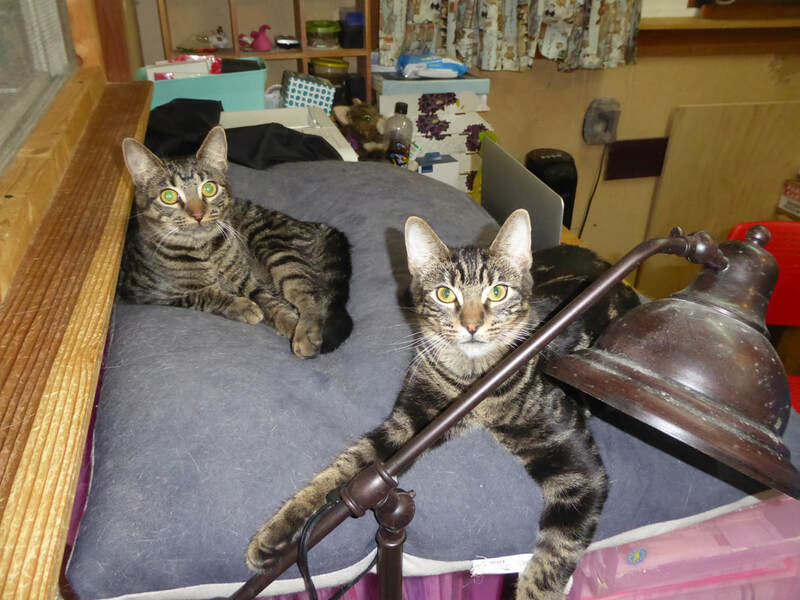 Katie & Yummy are bonded and play like a typical brother & sister - sometimes sweet, sometimes annoying. Yummy will cuddle up with his person and ask for love - which is why he is so yummy. Katie receives affection on her terms but is always close by. So there was a kindly grandfather who got a kitten for his grandchildren. The only problem was that she spent most of her time outside and soon she was with kittens. She delivered 4 of her own and then took on 4 from some other mommy. There she was - this little kitty, who wasn't even a year old, caring for 8 kittens. Fortunately, the grandchildren were much more responsible and word got back to rescue. They delivered the kittens to us and convinced granddad to spay the little Tortie and keep her indoors for the rest of her life. Between the love & care of the grandkids and the excellent care of rescue, these 8 kittens have become some of the best kittens ever. There will be a scramble of applications, so you'll want to get yours in asap! Brothers Chowder & Chilly are so very identical that Chilly has to wear a collar so we can tell these Flame Point Siamese apart. 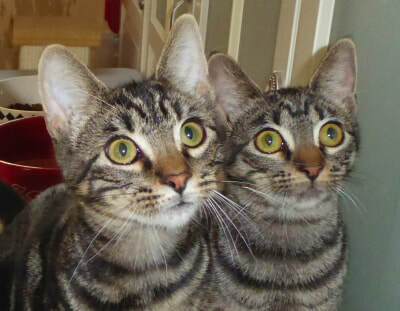 Both are exceptionally playful, friendly & affectionate. 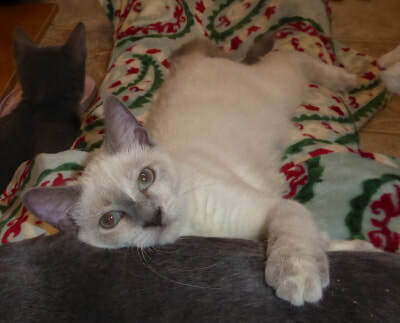 Heather, a Tortie-Point Burmese, is one of the most playful, affectionate and largest of the kittens. She has lots of energy and generally leads playtime. Dovey is one of the smallest & smartest. She's a Bombay mix Polydactal - look at that thumb! Sometimes she'll play with the group, but she knows that she has to stay out of the way. Her favorite spot is in the lap or on your shoulder - and she will jump to reach it! Now who doesn't love a perfect little Orange Tabby? That's Jet! 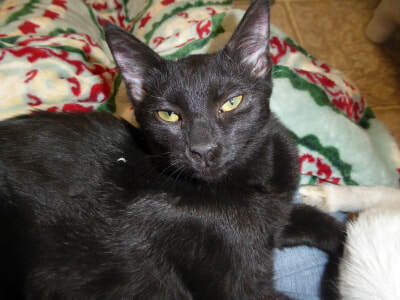 Jet is full of energy and will outlast all of the other kitties. Plus, he has to win! He has this wonderful other side that loves affection and cuddles as well. It's all about the feet for these two gorgeous Tuxedo boys. Fancy Feet is another Polydactal while Little Feet has just a touch of white on his normal toes. Both have huge ears - the better to hear you with! Both are very affectionate. Fancy Feet is the largest kitten in the litter and rules playtime. He also love to jump on your back and ride around on your shoulder - so get ready and keep his many claws properly trimmed. Little Feet will wait to eat his meals until he's had some proper affection - so very sweet.